As a kid, you think that the moment you buy a metal detector, you start finding all kinds of cool stuff. Most of the time, all you find is old bottle caps, but for one Australian treasure hunter, he found much much more. 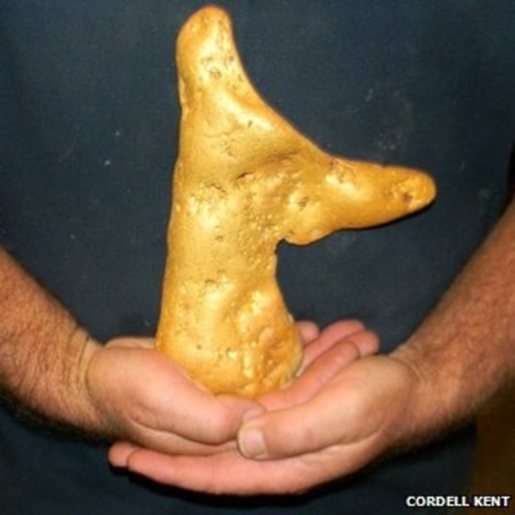 Outside the town of Ballarat, Australia, a man with a metal detector discovered a massive gold nugget. The impressive nugget weighs 177 ounces (a little over 11 pounds). Given the current value of gold, it’s worth about $315,000 in US dollars, with a monetary bonus for its sheer size and the novelty of its story. Amazingly, the nugget was less than two feet (23.6 inches) underground. Indeed it is, good sir. Indeed it is. I know that I could never find something that impressive, metal detector or not, but man, it makes me wish I had a metal detector and a gold field somewhere nearby.